Kota Arai was raised in Aogashima island(the most southern island of the Izu islands in Tokyo).He grew up accustomed to the region's art and music (traditional drum,songs,dance). He was big inspired by renowned drummer Brice Wassy from Cameroon in Africa. And he has travelled to Cameroon to study traditional African rhythms. He has received the high acclaim for his natural energetic rhythms and groove created by his mastery in Japanese and and East asian and Afro traditional rhythms. He is a one of the master drummer of the traditional drumming culture in Aogashima island(Kanju-taiko) and Hachijo island(Hachijo-taiko) .He can play various color of rhythms and grooves of the traditional drumming.They has a long form of drumming culture that dates back more than 400years.It is also said that there is a history of 800years. 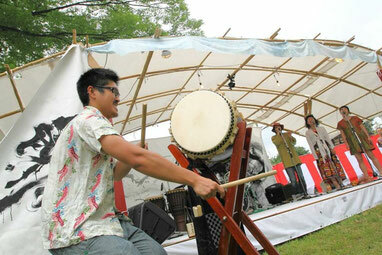 He is one of the very few taiko players who can express the real sounds of Hachijo-taiko and Aogashima-taiko. Their drumming culture is said that it is the most melodious and historically rich and warm and unique forms of Taiko drumming in Japan.It is the special culture of Taiko-Island in japan. 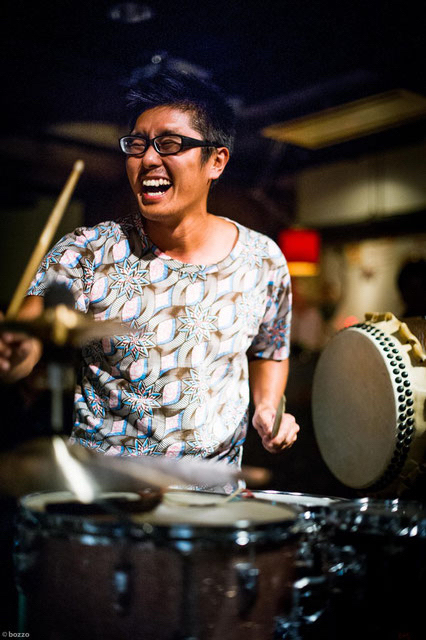 He performs and holds workshops to share the beauty and the pleasance to play Hachijo-taiko and Aogashima-taiko with group of members at the many places in the world.